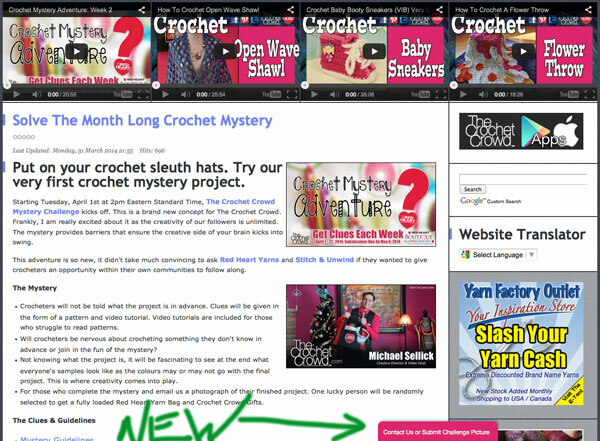 The Crochet Crowd Website has received an upgrade to allow our fans to communicate more effectively with us. You might not believe how many people email us and forget to give us details to help us out when answering questions. Some people email in Challenge entries forgetting to attach a picture. Name and addresses are missing from the challenges so we can identity who the picture belongs to. Yarn giveaways are missing information for us to identify the winner. Questions pertaining to a pattern where we are not told what pattern they are referring to. People don’t use a Subject Title and it slams into our junk mailbox because our system thinks it’s spam. We are emailed constantly on how to submit a photo for our challenge. Our new contact form is at the bottom of every page on our website. Our new system will allow us to be more effective in helping you fill out the information we need to help you without playing email tag. Our system will identify which web page you were on when you emailed us. This helps us narrow down the pattern you are struggling with or something pertaining to the item on the page if that is an issue. It will identify each email with a Ticket # so that we can keep our tickets in order and respond in a timely fashion. Many people email us with CAPITAL LETTERS – HELP ME NOW… URGENT HELP… OPEN IMMEDIATELY… We still respond in emails in priority of when they come in, regardless of the capital letters. Sorry to burst any bubbles. We have a lot of email and need to treat everyone equally. The ticket numbers will help us know how old an email has been waiting. For challengers, you can upload up to 5 photos with a maximum of 5 megabytes for the submission. The form requires your information for the submission so we are not playing email tag with you. Your subject line is still important. Please be specific. When we ask for a subject title to be something, it means our email filters are looking for that name to sort itself out. It helps the emails stay out of the junk mailbox. Though we cannot guarantee a response to all emails due to the number of emails we do receive. We skim through and try our very best. Challenge and Giveaway Emails always take priority as there are deadlines associated to it. So if you are looking for how to submit your challenge picture, enter a giveaway (when we are running one) or just need to contact us over another issue. All you need to do is look at the bottom of any of our webpages and find the contact us button to push. This entry was posted in Announcements and tagged Cathy, Contact Us, crochet crowd, Help, Helpdesk, Mikey. Bookmark the permalink. Thank you for the new communication headline, I’m sure I will be using it everyday. I pray this will help you to take time & smell the roses. Saw it yesterday on Crochet Crowd challenge page and thought how fabulous. I am new to Crochet Crowd and could not find how to submit the challenge entries. This makes it so much easier.